We won’t because we oughtn’t. When people pay traffickers around £6,000 for a crammed place on a flimsy inflatable, they are putting their lives into the hands of callous gangs of criminals and racketeers. They may dream of free board and lodging in a Kent B&B along with abundant welfare and education and health care, but the English Channel is not a calm, moonlit sea of tranquility: it is rough, icy and perilously stormy. If you don’t drown, there’s a danger of hypothermia. If you don’t freeze, you could be rammed by one of the thousands of ships which use the route daily, or left drifting for days without lights or radar to guide you to safety. Putting up a virtuous sign in Dover saying ‘Migrants Welcome’ is neither kind nor compassionate: it is a hook for the vulnerable and an incentive to the people traffickers. If the Home Secretary acquiesces to demands to put more border patrol boats in the Channel, the chances of successful landings in the UK are increased considerably: “It is feasible that, were we to put out additional craft, they might act as a magnet – encouraging people to make a perilous crossing,” Sajid Javid said. And he is right, of course. 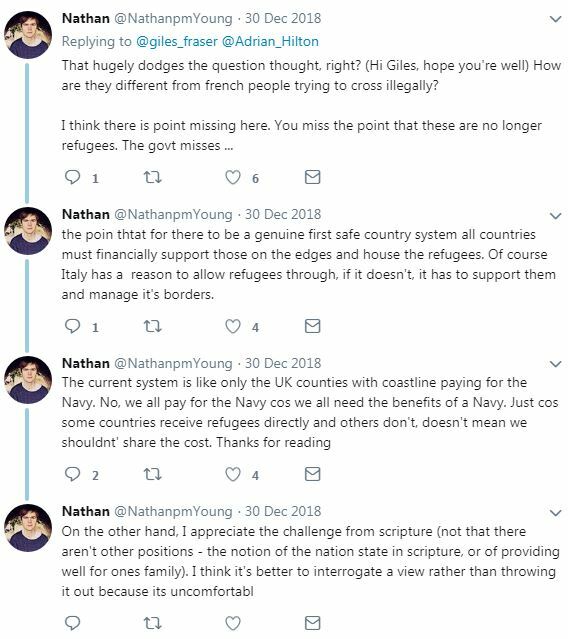 This wouldn’t bother Giles Fraser or Nick Baines, who would be perfectly happy for millions of migrants to make their homes in the UK, seemingly irrespective of their motive or need. Is it millions, or just thousands? Or is it only a few hundred? What is the limit? If we are to take “as many refugees and asylum seekers as we can. And then some more”, where are they going to live? Which schools do their children go to? How does the headteacher pay for the necessary learning support and language assistants? Which GP surgeries and hospitals will have to meet their health needs? And who is supposed to pay for it all, when we seemingly can’t even cope with the homelessness and poverty we already have? For the moral imagination of the Hebrew scriptures was determined by a battered refugee people, fleeing political oppression in north Africa, and seeking a new life for themselves safe from violence and poverty. Time and again, the books of the Hebrew scriptures remind its readers not to forget that they too were once in this situation and their ethics must be structured around practical help driven by fellow-feeling. Not all the Channel migrants are genuine refugees. If they were, they would claim asylum – refuge – in the first safe country they landed in; such would be their desperation and appreciation of a nation’s hospitality and compassion. They wouldn’t pick and choose their destination depending on language preferences or welfare largesse: they would seek immediate shelter and protection from the dangers they were fleeing, as the Israelites did from the Assyrian conquest in 740 BC. We should, of course, treat them all with kindness and compassion, but sometimes it is necessary to be cruel to be kind. 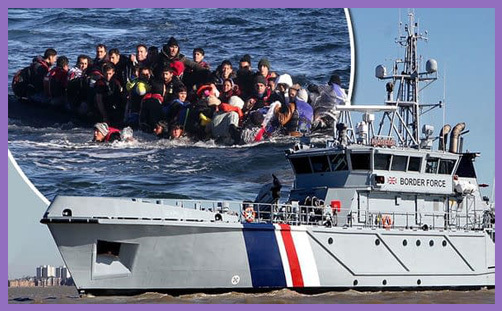 If Channel migrants are not sent straight back whence they came, more will attempt the perilous journey, more lives will be lost, and more traffickers will arise to meet the market need. The greatest compassion we could show them would be to work with our French neighbours to alleviate the suffering where it is, and to show them that Christ walks among them where they are and meets them in their sodden tents and cardboard churches. We should work on the ground in Iran, Iraq and Syria to create safe spaces – sanctuaries – so that the need to flee might be mitigated. In the meantime, let us be kind and welcoming to the refugee children, for they must be suffered above all, as is divinely ordained.